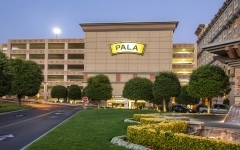 Pala Casino Spa Resort, located in North County, San Diego, is owned by the Pala Band of Mission Indians. 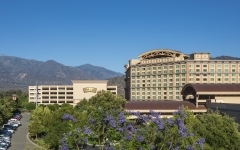 Set against the tranquil backdrop of the Palomar Mountains, the destination draws in gamers from around the world. 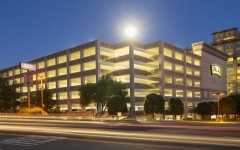 The original 208,000 SF parking structure, completed in 2003, is a four-level, 541-space garage. The exterior finish of the garage, especially the concrete spandrels, was clad with EIFS (Exterior Insulation Finish Systems) material which includes numerous architectural reveals to mimic the casino hotel exterior design and blend in with the overall look and feel. The elevator cores were also clad with EIFS along with 10’ high earth-tone stone material at the base of the elevator shaft. 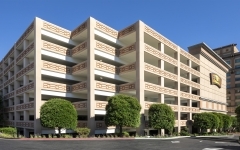 The expansion of the original parking structure is the first part of a 2018 top-to-bottom enhancement to the property. This expansion involved adding three levels, increasing the stall count by 416 spaces. New micro piles were drilled through the ground-level slab, and pile caps were enlarged to support the weight of the additional levels. Updated lighting and illuminated signage throughout the garage improves energy efficiency and guest safety.